The core of BishopAccountability.org's library and online holdings is a remarkable collection of tens of thousands of diocesan and religious order documents. On this page, we provide an overview of that document collection. We describe the archives and the circumstances of their release, with links to selected archives, and we offer a sampling of individual documents. The archives were made public in connection with sexual abuse complaints, after criminal investigations or document discovery in litigation. But the significance of the archives transcends the legal proceedings from which they emerged, and the often protracted battles to unseal some of the files. After the court orders and the settlements, a treasure trove of documents is now in the public domain. But the archives are scattered in courthouses from Maine to California – our goal is to gather them all and make them more easily accessible to the public. This archive of archives is of course vitally important for anyone working to understand sexual abuse and its mismanagement in the Catholic church. As such, the archives complement our database of accused priests, our collection of investigative reports, our blog of daily news coverage, our collection of survivors' accounts, and our archives of church documents. But the document archives also offer a remarkably detailed case study for anyone working on sexual abuse and harassment in other institutions, and for scholars working on institutional response to crises. The archives will also be of great interest to anyone concerned with issues in Catholicism other than the sexual abuse of children – day-to-day church operations, episcopal relationships with the Vatican, ministry to ethnic communities, changes before and after the Second Vatican Council, and countless other topics. Other sexual abuse documents have been found in the laicization files of accused priests and in other diocesan and religious order files. In addition, documents that do not pertain directly to sexual abuse have been found in the accused priests' personnel files. Bishops and superiors of religious orders have fought the release of all these files and have claimed privilege to withhold many documents. They have in some cases destroyed documents. But a remarkably rich and important record has survived. Below we sketch the provenance of some representative archives, and provide links to complete archives and selections, so that the reader can explore the collection. Then we offer links to dozens of individual documents, to provide another means for assessing the archives. Hundreds of criminal investigations of child abuse in the Catholic church have been undertaken by government authorities, and in the United States, grand juries and attorneys general have released reports on their investigations of the following dioceses: New York NY (2002), Rockville Centre NY (2003), Manchester NH (2003), Boston MA (2003), Philadelphia PA (2003, 2005, 2011), and Portland ME (2004). The inquiries in Ireland were carried out by nationally mandated commissions and examined three dioceses (Ferns , Dublin , and Cloyne ), and the institutions run by Catholic religious orders (2009). In the Dublin archdiocese, Archbishop Martin gave the Dublin documents to the Murphy Commission over the objection of his predecessor, Cardinal Desmond Connell. The U.S. and Irish investigations quote documents obtained from the dioceses and religious orders. BishopAccountability.org has posted online the Philadelphia documents and the large Manchester archive, with audit documents, in their entirety. These documents are also available from the District Attorney of Philadelphia and the New Hampshire Attorney General. The U.S. bishops report that they have received complaints of sexual abuse regarding 6,115 priests from 1950 to 2011, excluding 2003. We estimate that more than 4,000 civil suits have been filed in the U.S. courts during that time, and in most of these cases, documents from the priest's personnel and secret archive files have been produced by dioceses and religious orders under subpoena. Some of these documents have been publicly filed with the courts, and some have been publicly released under the terms of omnibus settlements and in accord with court orders. BishopAccountability.org has gathered tens of thousands of pages of these publicly available church files. We have posted some archives in their entirety, and we have posted selections from the others. In the mid-1980s, attorneys representing victims of clergy abuse and journalists writing about the first cases began to learn about the system of church files. Media coverage of attorney Jeffrey Anderson's groundbreaking work on the case of the Rev. Thomas P. Adamson shows the state of the art at that time. (Anderson is pictured above, top right, announcing in 2011 the first production by the Vatican of abuse-related documents.) 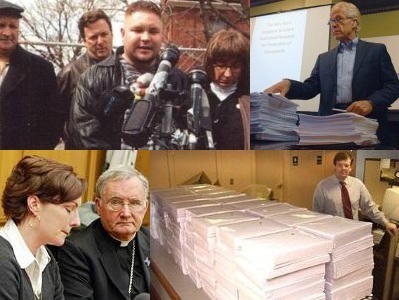 In the 1990s, reporters were sometimes able to obtain church files and quoted from them in coverage of several important cases. See, for example, the work of Boston Globe reporters on the case of Rev. James R. Porter, and Dallas Morning News reporters' detailed account of the Rev. David A. Holley documents. Despite the outward appearances of the bishops' Restoring Trust program (see their 1994 and 1995 reports), which was prompted by the Porter revelations, dioceses and religious orders in fact responded to the document-based work of journalists with measures to keep subsequent cases secret. The church asked judges to impound the court records of sexual abuse suits, and judges routinely complied. Settlements were negotiated in secret, and victims were made to sign confidentiality agreements as a condition of compensation. Security was enhanced and documents were shredded. A window on those developments was provided by documents that were at issue in the trial of Msgr. William J. Lynn. In 2002, this secret system began to be exposed by Boston Globe reporters working on the Rev. John J. Geoghan case and the allegations against Rev. Paul R. Shanley and other Boston priests. By early December 2002, events in Boston had set the scene for the archival emphasis that we see today, and the church was forced to renounce confidentiality agreements. The release of documents has increasingly become a nonmonetary demand of settlements involving multiple victims. Quiet settlements under arbitration have proved to be more durable, however, in Boston and elsewhere. The Sea Change of the Geoghan Case – The evolution toward the major document releases of the last ten years began with a lawsuit filed on July 9, 1996, by attorney Mitchell Garabedian on behalf of three victims of Geoghan. Many other Geoghan victims came forward in the late 1990s, and in September 2000, Judge James Hughes granted a motion by the Boston archdiocese to seal the files of all the Geoghan complainants. The Boston Globe filed suit to have the files, made public, and in November 2001, Judge Constance Sweeney unsealed the court records of 86 Geoghan plaintiffs. The archdiocese appealed, arguing separation of church and state. On December 21, 2001, Judge Cynthia Cohen rejected the archdiocese's appeal, and on January 24, 2002, the Geoghan documents were released. Our holdings comprise 8,478 pages of depositions and Geoghan's own files; see a selection of Geoghan's documents. The Globe then found that the court files of suits alleging abuse by other priests also appeared to be impounded, and the newspaper successfully filed suit to unseal the court files of three more priests. Pattern and Practice and the Shanley Case – On February 13, 2002, attorney Roderick MacLeish filed the lawsuit Ford v. Law on behalf of a man who claimed he had been molested by Rev. Paul R. Shanley. (Mr. Ford is shown with his parents Rodney and Paula, and Mr. MacLeish, in the photo on the upper right above.) On April 4, 2002, Judge Leila R. Kern denied the Boston archdiocese's motion for a gag order on Shanley documents to be provided to the plaintiffs. The first production occurred the next day, and the documents were made public on April 8, 2002. See a selection of the Shanley documents. MacLeish then subpoenaed the files of more than 140 accused Boston priests to establish archdiocesan pattern and practice. Those documents started to be publicly filed on December 3, 2002, precipitating the resignation of Cardinal Bernard Law on December 13, 2002. As priest files continued to be produced in 2003 and filed with the court, the documents at the courthouse became the largest de facto public archive of priest personnel and secret archive files. BishopAccountability.org has acquired a nearly full set of the public Boston files, a total of 28,035 pages, and we provide an online selection of 1,569 pages from those files, together with MacLeish's pattern and practice brief. On December 10, 2002, less than a week after the first filing of Boston documents, the Attorney General of New Hampshire finalized with Bishop John B. McCormack an agreement for the eventual release of the Manchester diocesan and investigative files. McCormack had handled Boston abuse cases as Cardinal Law's delegate in 1993-1994. The above summary describes only a portion of our holdings, which also include important collections of documents from the files of the Jesuits and the Servants of the Paraclete, complete files of many other accused priests, documents obtained from the Vatican in discovery, files of accused priests who have worked in Mexico, and trial transcripts and exhibits. We will post an additional 20,000 pages of files by year end, and we are constantly acquiring new archives. • Survivor's Wife: "During my childhood and up until now, my heart would always beat a little faster as I received Communion." • Survivor's Parents: "It seems you have forgotten that our son is the victim." • Survivor's Wife: "The most damaging of the information that I discovered was from a retired nun." • Archbishop Kelly: "I deeply regret your present circumstances, but I do not find myself able to alleviate them in any way." • Survivor's Parents: "They were made to feel more like the criminals instead of victims." • Archbishop Kelly: "The restrictions Miller gracefully accepted on his work." • Newsletter by Rev. Paul R. Shanley – During 1972 and early 1973, Shanley wrote a newsletter and distributed it to a mailing list with the help of his secretary, Eileen Mulcahy. Several hundred pages of this newsletter are preserved in archdiocesan files. See Shanley's introduction to this writing project, in his Christmas letter of 1971. • Did worried parents ever try to get information about a priest's career? - Dioceses used the borders between parishes to restrict information about abusers and facilitate their quiet transfer. In this document, a fearful parent requests information about Fr. Joseph Birmingham. • Are there examples of such requests being rebuffed? - Fr. John McCormack deflects the parent's question, although McCormack knew that there were already allegations against Birmingham in the chancery files, and indeed had personal experience of Birmingham's behavior. • Did the dioceses keep track of allegations? - This detailed chronology of allegations against John Geoghan was written in 1994. A few years later, Cardinal Law granted Geoghan's request for Senior Priest Retirement Status, praising his "effective life of ministry, sadly impaired by illness." • Do the files offer any examples of harmful clericalism? - This letter from John Geoghan's pastor, denigrating a credible abuse complaint in the middle of the priest's sorry career, is one of the worst examples of this clericalism, especially read with Bishop Daily's reply to him. • Did bishops sometimes lie in order to transfer priests to unsuspecting new dioceses? - Bishop Banks told the San Bernardino diocese that Paul Shanley was a priest in good standing, thirty years after the Boston archdiocese began to receive allegations against the priest. • What does a treatment center report look like? - Treatment centers are an important link in the quiet transfer of abusers into unsuspecting parishes and dioceses. This report from the Institute of Living on Joseph Birmingham provides a window into the process. Its assessment of Birmingham is complacent and inaccurate, but even its mild recommendations were ignored by Cardinal Law. Birmingham was subsequently assigned to a parish without restriction, and without telling the parish about his past. • Is there any evidence that dioceses manipulated the treatment centers? - In this letter, Bishop Robert J. Banks makes clear that he wants a more upbeat assessment. He receives an Orwellian but compliant answer. • Have these documents ever had a major effect on the crisis? - These notes (pictured above) by Fr. John B. McCormack on a 1993 meeting between Cardinal Law and Fr. James D. Foley probably resulted in Law's resignation. In the meeting, Foley revealed that he had abandoned one of his female victims during a fatal drug overdose. Despite this admission, Foley continued to serve in parishes for almost ten years, well beyond the bishops' Dallas meeting. He was removed only when the archdiocese accidentally released his file, mistaking him for another Foley, and the story came to light. Law resigned a few days later.